It's bedtime! This day is done and now we're thinking ahead to tomorrow. 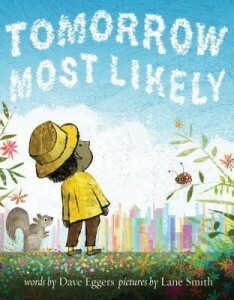 This young'un is invited to let his mind wander to the possibilities that tomorrow might bring. Now...this isn't your typical make-the-most of your tomorrows story because it's in the hands of Dave Eggers and Lane Smith. We are in the land of quirky. It's set in a city that might seem familiar to many of us with its skyscrapers and its park. It gives rhyming a try and occasionally waxes eloquently. But mostly this is full of surprises and things that you at first see one way and then discover to be something completely different. Just like most people you encounter in your own day if you really look and listen. Our main characters are a young brown boy and YOU. Together we review what a tomorrow could bring. Most days it turns out have the ordinary and the expected in them. Brown cereal and a blue sky are part of the routine feeling of a day. But the possibility of something beyond your wildest imagination is also there and the fact that YOU are in the day changes all the rules. There is a hint of Dr. Seuss' voice in the background with a beat of the silly and a soar to the sublime. Lane Smith as always rises to the occasion to pepper the pictures with curiosities and to invite us to see beyond our own boundaries in the big and the small. So, spread your wings and enjoy being you in this grand world and above all, see the amazing gift of a tomorrow and make it yours.